The woes of taxi service app Uber refuses to die down. After Delhi banned Uber services, it’s the turn of Karnataka, Maharashtra, Telangana, Uttar Pradesh and Chandigarh to ban it’s services. 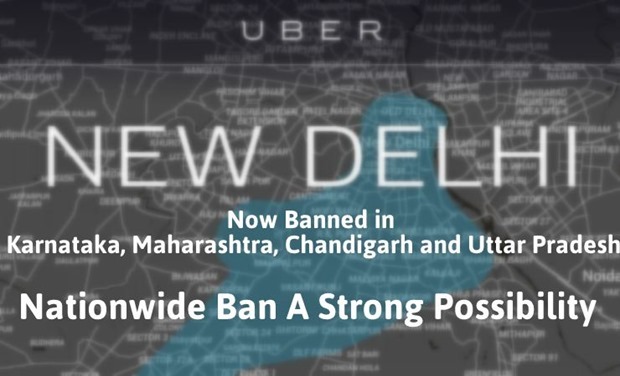 As per the Central Government’s advisory to all states regarding the services of Uber, there is a strong possibility that a nation-wide blanket ban may soon be placed on its services. Central Government’s advisory clearly states that if Uber or any other taxi rental service doesn’t comply with the rules of the state, then place a ban. And it seems that along with Uber and other such app based taxi rental services like Ola and TaxForSure too were not complying with the rules. Maharashtra Transport Secretary S K Sharma said, “We have asked authorities to immediately stop Uber and Ola’s services”. On Tuesday, Delhi Government had announced that out of 20 operating taxi rental services in the city, only Easy Cab, Mega Cab, Meru Cab, Chanson Cab, Yo Cab and Air Cab had licenses to operate taxi services and were complying with the transport rules. Hence, along with Uber, other popular app based taxi rental services such as Taxi-for-Sure, Ola, Quick Cabs, Delhi Cab, Wyn and Cosy are also banned in Delhi. It is not yet clear about the fate of these cab services outside Delhi, but considering that the rule is same for all, there is very little chance that these would be allowed to operate. Uber has around 3000 drivers registered with them, all over India. After the ban takes places, all of them would be jobless. Similarly, there would be drivers and employees associated with other banned app based taxi rental services, who are now jobless. Some skeptics are terming this as an overreaction to an unfortunate incident, which could have happened with any taxi operator – licensed or unlicensed. This decision by the Government can literally kill a growing industry, and create an unfavorable environment for startups and technological companies in the country. Other critics of this decision are stating that Government is trying to hide it’s own inefficiencies of maintaining law and order by imposing an unnecessary ban on all taxi operators. Elections in Delhi are near, and any negative perception can be a bad political news. But the fact of the matter is, Uber had violated rules; but again, why didn’t the Government check their licenses and norms before? Were they waiting for such an incident to happen before acting? Do share your views by commenting right here.